As I am still in Italy I have a treat for you, a blog post all about beautiful bento lunches. Hello lovely readers, do let me introduce myself! My name is Grace, and I blog over at Eats Amazing on the subject of healthy children’s food, with a particular focus on the bento style lunches that I make daily for my six year old son. 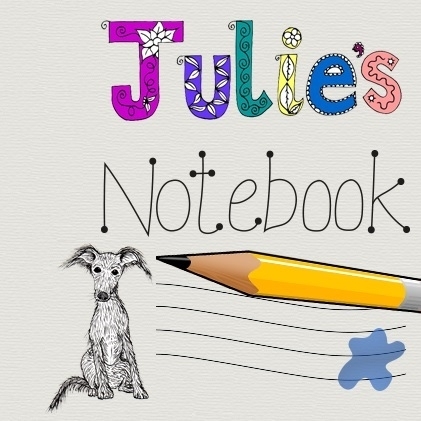 Julie very kindly asked me to write a guest post for her, and I was very happy to oblige – I do love rambling on about my favourite hobby – bento! You may be wondering what on earth bento is, but if you are, don’t worry, I’m here to enlighten you! Bento is a Japanese word, meaning ‘convenient’, and it refers to a meal, packed in a box, most commonly for lunch. It’s basically the Japanese equivalent of packed lunches. What makes bento different from the packed lunches that we’re used to here in the UK though is that all the food is packed tightly into one box, arranged so as to be pleasing to the eye as well as the taste buds. Japanese Mums have been packing bento lunches for their children for years, and in some cases they get incredibly creative, sculpting elaborate designs such as cartoon characters or portraits of famous people from rice. The idea of bento has also recently been taken up in other parts of the world, particularly America and more recently here in the UK, as bento offers an interesting and healthy alternative to our ‘traditional’ sandwich style lunch. The Japanese tend to fill their bento boxes with the rice and vegetables that comprise the usual Japanese diet, but when it comes to the kind of foods you can put in your own bentos, there are endless possibilities! I started making bento lunches myself nearly two years ago when my older son started school. This lunch was really fun to make! The panda on the left is a hard-boiled egg, shaped using an egg mould (one of my favourite tools of the trade!) The cucumber was cut into flowers using a mini bento cutter, and the elephants were homemade tortilla crisps (shapes cut from a tortilla wrap using a cookie cutter then baked in the oven). 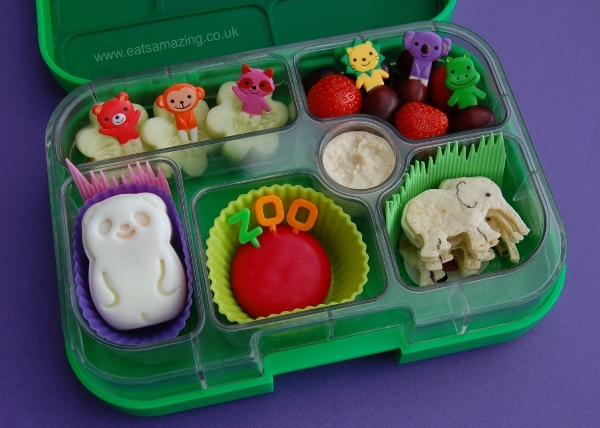 The little animals and alphabet letters are food picks, which are specially designed bento accessories that are used both for decoration and as mini forks/picks to help pick up the food). I also used silicone cups and ‘baran’ (dividers) to hold some of the food and add a splash of extra colour. You can see full details of this lunch here. This lunch was made to celebrate World Turtle Day earlier this year. 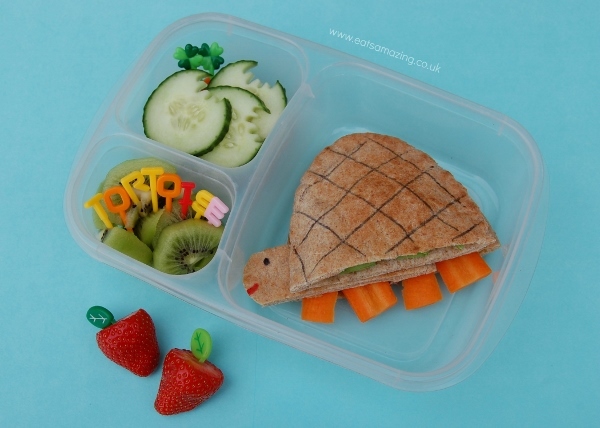 The ‘tortoise’ was made from a wholemeal pitta bread, split and stuffed with roast beef slices and salad, with carrot ‘feet’, and I decorated the shell with an edible marker pen. I used food picks to decorate the side portions of fruit and vegetables. You can see full details of this lunch here. This lunch was packed in a traditional Japanese two-tiered bento box. The two halves stack on top of each other and are held together with an elastic strap. 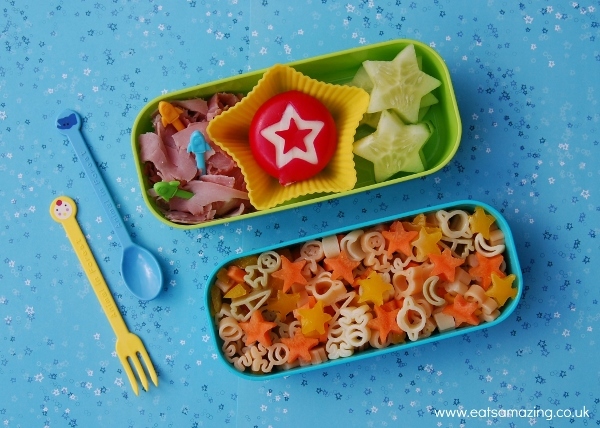 I made a simple pasta salad using space themed pasta with stars cut from raw yellow pepper and carrot (using a tiny star shaped bento cutter). I also used star cutters to cut a design into the wax of the Babybel and shape the cucumber slices. You can see full details of this lunch here. I made this lunch for science day at my son’s school. I filled a plastic test-tube with raisins, decorated the sandwiches with edible marker pens, cut the carrots into stars using mini bento cutters and I added some sprinkles to the yoghurt. You can see full details of this lunch here. 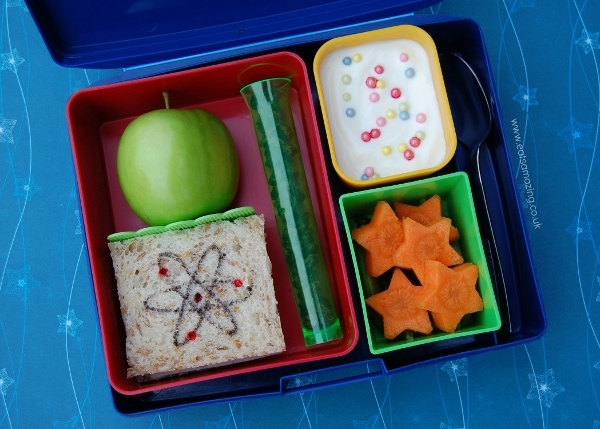 As you can see, I love getting creative with bento lunches and making the food really fun for my son, but bento doesn’t have to be complicated. All you really need to make a bento lunch is a box and some food – the healthier the better of course! Why not give it a try yourself? There are quite a few benefits to packing lunches in this way: they are very ‘green’ because they don’t require extra packaging such as cling-film or tinfoil to be used, they are incredibly flexible, as you can fit most types of food into a bento box, they can make food look very appealing, and their flexibility makes it easy to create a healthy and balanced meal. Wow I really need to up my game in the lunch stakes – currently I am eating left overs again! It gives me food envy… Like in an inspired way not a nasty jealous way.